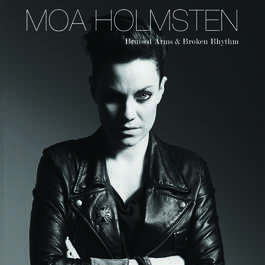 The songs of Bruce Springsteen might seem like an odd choice for the Swedish recording artist, Moa Holmsten. After fronting the heavy metal band, Meldrum, and then releasing two dynamic and avant-garde albums of her own songs (Do You Want Me, Death? and All Blade, No Handle)... Moa Holmsten and Tony Naima went into the studio in 2013 and emerged with a startlingly creative reworking of the Springsteen classic, "Badlands." They had such a good time creating this cover song, they decided to try another... and another... and another. In the end, they had completed fourteen tunes spanning across Springsteen's entire career... from the obscure to some of his most well known... but always in a completely fresh and original way. Holmsten and Naima are not the typical die-hard fans of Bruce Springsteen one would expect after hearing their carefully crafted and respectful interpretations of his songs. As Moa says, "We have always respected Springsteen... but I believe the fact that we are not intense and longtime followers of his work has been essential from the beginning. We could discover new songs and re-discover older ones, and work on them with a unique perspective. We could be brave and courageous, while not letting old emotions or presumed expectations stand in our way." The resulting musical creations ended up all over the stylistic map (from the current pop sound of "Dancing In The Dark" and "Tougher Than The Rest" to the rustic and organic "Highway 29" and "Sad Eyes" to the haunting and spare "Streets Of Fire" and "You're Missing"), and each evolved into a life of its own. Holmsten offers further insight into the project by saying, "I have compared this whole recording experience to falling in love with someone. Getting to know someone for the first time. The first fumbling steps. A person with a history and a past. The last thing you want is to be told from other people what kind of person he or she is. You want to find out for yourself. To see the side of this person that nobody else has seen. This is why I have consistently refused to read articles, books and interviews with Springsteen. I wanted to find out for myself. My own version of an American icon. Not the typical portrayal of him. And that, in a way, can't be questioned. This is how his songs spoke to me. Our relationship slowly progressed, and I have now totally fallen in love with him. I hope that it's mutual..."